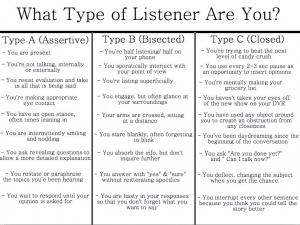 How well are you at listening? Imagine if you weren’t allowed to use any “what’s” or “huh’s” during your conversations. Would you feel confident that by the end you would have heard and even more importantly understood what was being said? Listening and having an “open mind” isn’t explained as letting words come in one ear and out the other. It’s about being able to entertain different viewpoints and working hard to read between the lines of what is and is not being said. Often times we think we are being a good listener when in reality we are more concerned with voicing our own opinions than hearing anyone else’s. Handing over total control of a conversation is a lot tougher than it sounds. It actually takes a great deal of practice to become an expert listener. This video will help you to improve your listening skills using 6 concrete steps. We often share our thoughts, feelings, and opinions simply because we want to feel heard. Those who really listen stand out from the crowd. We like them. We respect them because they validate us and make us feel heard. Practicing these skills on a daily basis will guarantee a more developed and concentrated way of listening. Pay attention to the details. Good listening starts with silence.